The first impression is good: Printed in A4, with an almost too robust binding, nice layout and four-colour printing throughout. This is a whole different league from previous numbers of the magazine. If The Waiting Room produced a magazine like this every couple of months it would be a good thing. Unfortunately, they don't. “The Genesis Web Fanzine”, as they call themselves, is a very simple internet site with rather outdated technology and visuals. Which makes the anniversary number all the more of a surprise. A hundred copies were printed of this magazine which seems very little considering the English fanclub has been active for 30 years. Then again, both marketing and the ordering process (via Facebook and private messages to Alan) appeared rather slow and not too professional. 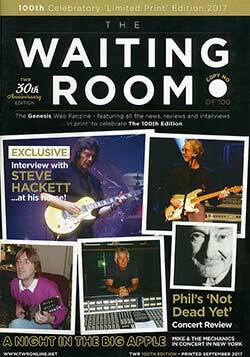 When, for comparison, the German Genesis fanclub produced a special edition magazine for their 20th anniversary they offered it on the website, and it sold out quite fast. If you bring out a magazine to celebrate your 30th anniversary and if it's the first special edition ever and the first special jubilee activity of a fanclub – shouldn't you come up with something better than to simply publish some current staple articles and reviews with some superfluous stop-gaps in printed form instead of online? 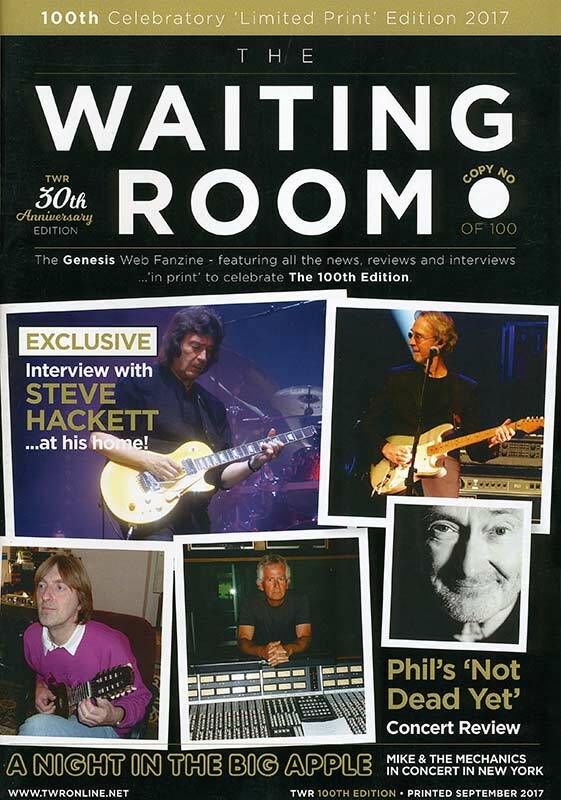 There could have been so much more … a report about 30 years of fanclub work in The Waiting Room, a list of everybody who was interviewed, photos from 30 years, testimonials from readers, greetings from band members, messages from various managements and other things like that. Why create one attractive magazine with current material instead of addressing the anniversary and giving the fans a product that documents the strengths of the fanclub and shows what its work is about? Is there nothing worth mentioning in this direction? These days there are modern Genesis-related websites with the whole shebang, with databases and forums, the Italian and German fanclubs have more or less regular conventions and special events, some fanclubs publish three or four printed magazines that are at least on a par with the TWR special edition – it certainly ought to be possible for TWR to bring out something similar? Demanding £ 20 in advance for The Waiting Room #100 and delivering such a nice but utterly unspectacular product does not do justice to the occasion. Other fanclubs work quietly and celebrate their anniversaries in style – not much comes from England in this way. I did not expect too much, and I was pleasantly surprised by the design of TWR #100, but there could have been more in the way of attractive and relevant content. The original signatures by Anthony Phillips and Steve Hackett do not justify this price either. It is a pity, after 30 years in the waiting room. Remaster Edition 2008 - Double-CD with Bonus tracks.